Handmade diaper changing pad cover! My husband, Rob, is a huge Star Wars fan. When we found out we were having a boy, I decided I’d give a little nod to my husband’s interest by designing our son’s nursery using the Star Wars theme. I noticed that a majority of Star Wars items were dark colored (Darth Vader wears all black, the backdrop for being in space is black, the movie posters had dark colors etc). 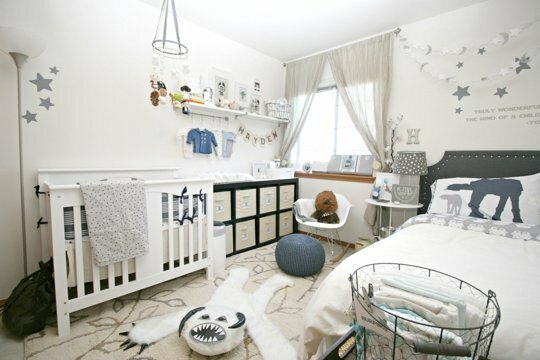 I wanted to create a nursery that was gender neutral with soft and bright tones. I also didn’t want the room to look too “cartoony” and too busy with Star Wars prints. I opted for the colors: white, grey and khaki. I also wanted to incorporate a shape (stars) to tie everything together. Since Star Wars can be a little too mature for babies, I tried to create a room that was baby friendly --- Darth Vader looking cute rather than scary and evil. My mother-in-law, gifted us with a remote controlled, wall mounted lightsaber that we use as a night light. 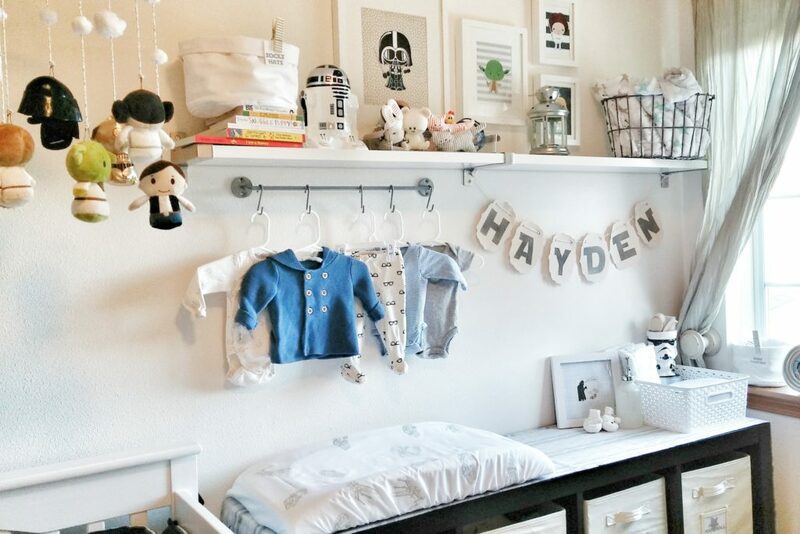 Since I also wanted specific Star Wars items in the room, I handmade a few things such as: the death star, put together the wall art, traced and cut out the vinyl stars for the walls, pieced together the mobile, cut-out the felt for the moon+ stars garland, made the diaper changing pad and the diaper changing pad cover. Two of our very close friends handmade the Wampa rug! Love this adorable toom! Is the changing table from IKEA? DO YOU KNOW which shelving unit it is? Our newest arrivals room is super small and this would be a perfect fit! The changing table was a regular cube storage unit from Costco. We put a grey runner over it and a nonslip mat under the changing pad to keep the pad from slipping! i love the duvet and sheets! where are they from?? It looks like they are currently out of stock! I live in the beautiful Pacific Northwest with my handsome husband, Rob, and my super smiley baby, Hayden. My favorite things lately have been: collecting antiques, Paris, shopping, cooking, discovering new restaurants and spending time with my friends and family!